From H-58 just north of Melstrand turn left onto the gravel road marked by the Chapel Falls sign. Follow the signs about 6 miles to the Chapel Falls parking area. From the parking lot near the restrooms is a sign for the trail to Mosquito Falls. The trail is marked from the parking area, and is about 1.2 miles. The trail is steep at times and rougher than the trail to Chapel Falls: it has some switchbacks up the hills. 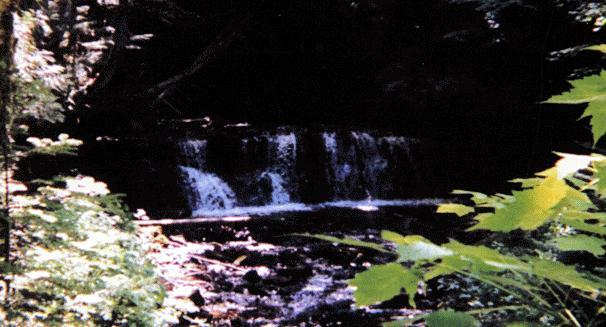 You will reach a wooden sign marking Mosquito Falls. There is an arrow someone carved into the sign pointing farther down the trail. I continued to follow the trail and came to another falls that actually appeared bigger than Mosquito Falls. Just beyond that falls the trail comes out to a road which crosses the river. The photo above is not of Mosquito Falls (that photo did not turn out) but of the unnamed falls beyond Moquito Falls. If anyone knows the name of the falls in the photo, I would appreciate hearing from them. 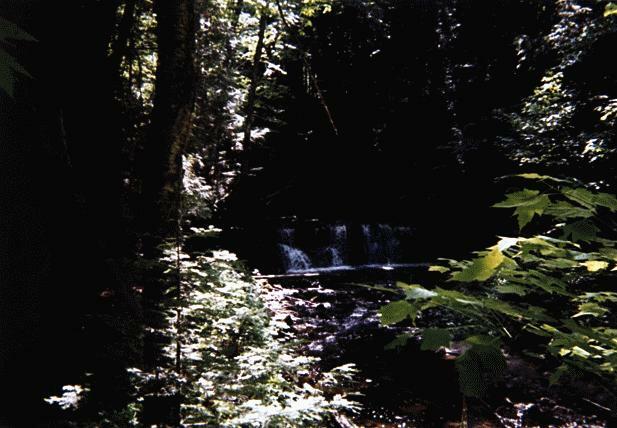 I followed a different trail to Mosquito Falls from that which is given in the Michigan Waterfall book. Their directions are from the road leading to the parking lot. I believe the marked trail is more recent than the book. However, the trail in the book may not be as rough to walk as the trail I took. See also Chapel Falls, which you can get to from the same parking lot. Here is a close up of the waterfall.